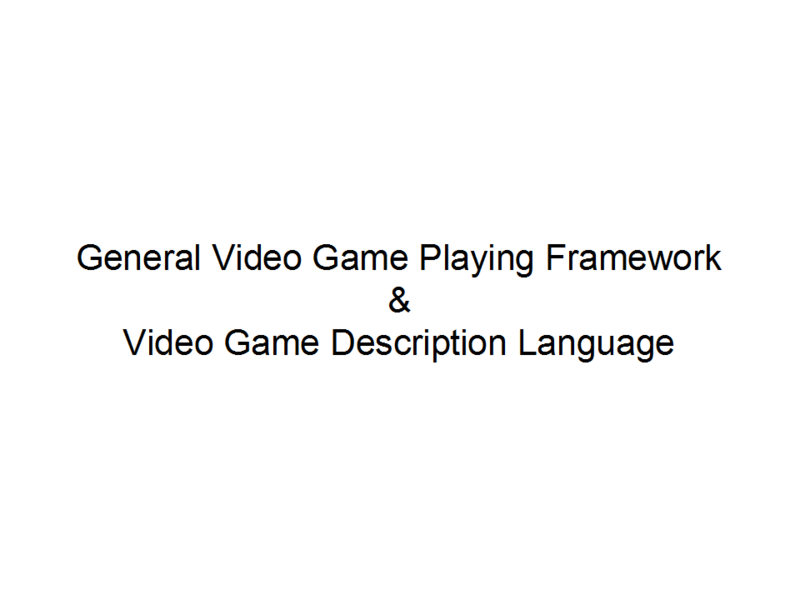 This post is a presentation I did couple of weeks ago at Game Innovation Lab (GIL). 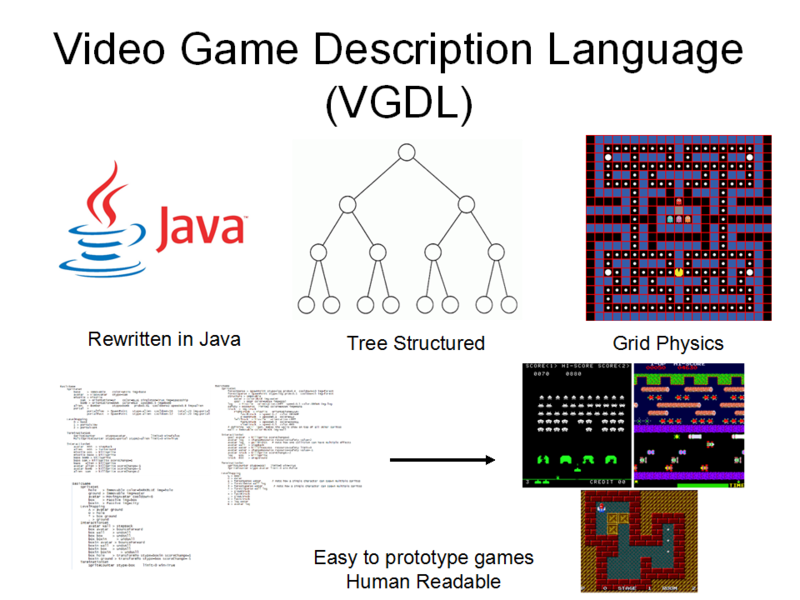 It supposes to help people at the lab to understand VGDL and GVG-AI framework. I think that if we want VGDL to evolve, more people should know about it and use it. This evolution won’t happen without showing to people the power of GVG-AI Framework and VGDL. There is lots of development happening to improve the framework and language and making it more accessible to people (creating an Interactive Visual Editor with computer assist). The following paragraphs are my slides with a description for each slide. 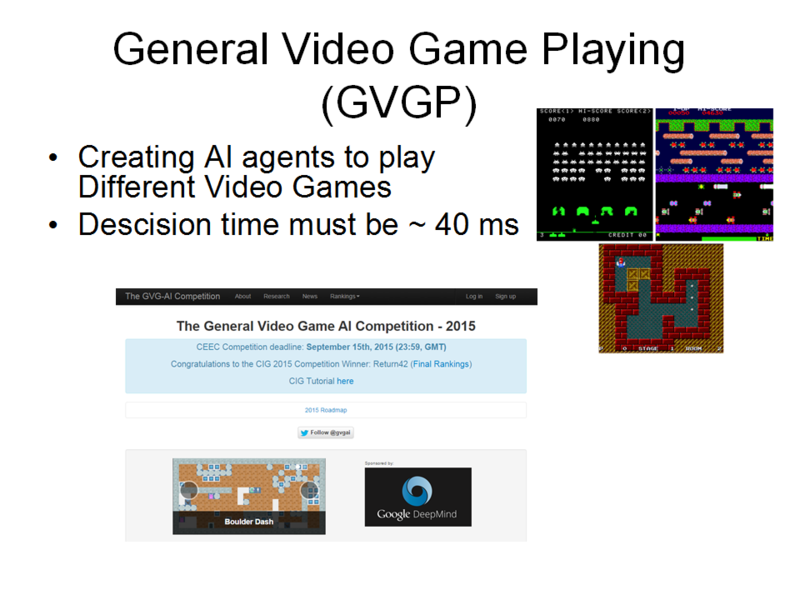 General Video Game Playing (GVGP) is creating an AI agent that can play different video games (not a certain game) efficiently. The hard constrain on these agents that they need to have a response time in about 40 msec. 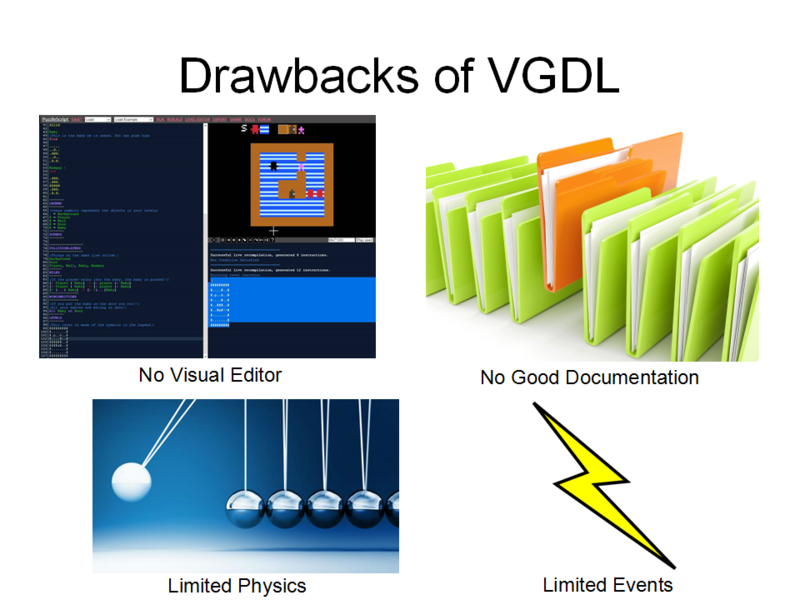 The current drawbacks of the VGDL: It hasn’t a visual editor, It hasn’t a good online documentation for the language, It has limited physics (no continuous physics to prototype games like Cut the Rope), and It has limited events (all game events are restricted with collision events between objects). Right now people are working to improve these drawbacks and make the VGDL more accessible to more people. Check the current draft of documentation and may be you could help improve the writing and improve it (link). 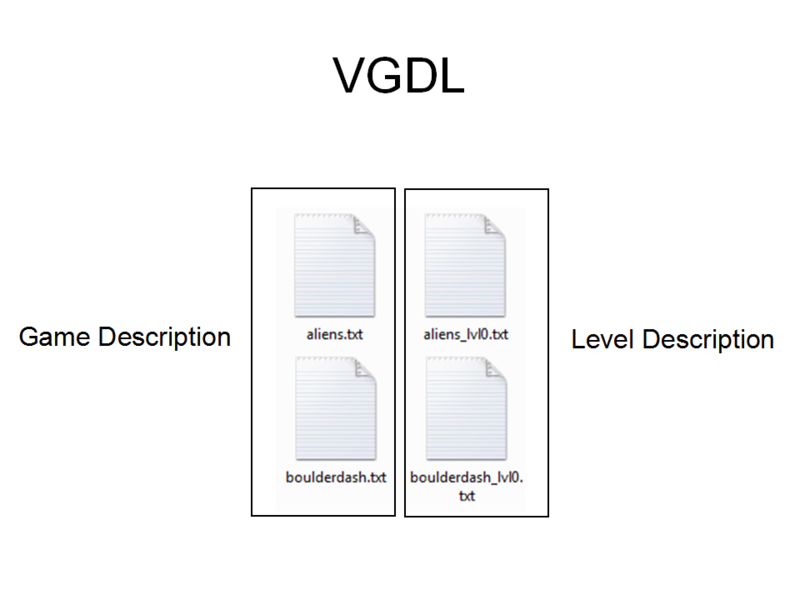 In order to write a game using VGDL, you need to provide two files (Game Description File and Level Description File). The Game Description File describes the whole game (What are the game sprites? 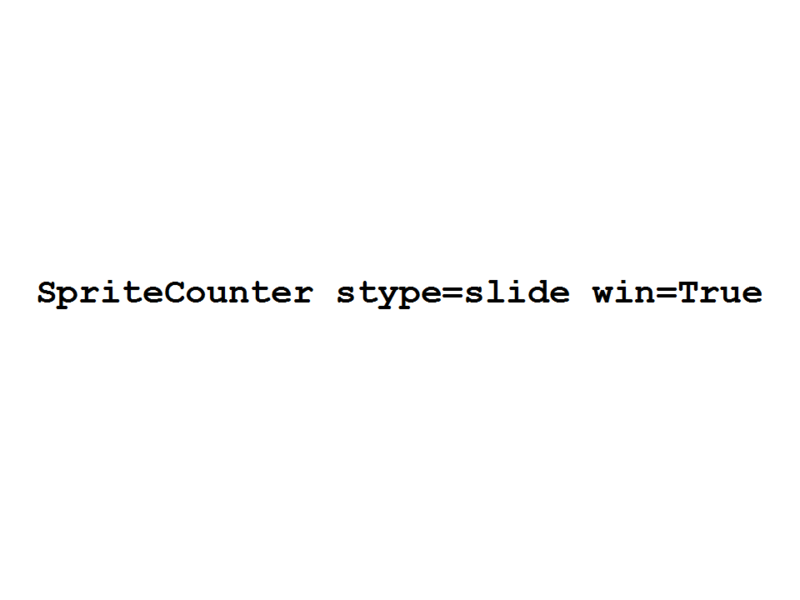 What’s the termination condition? How do sprites interact? …etc). 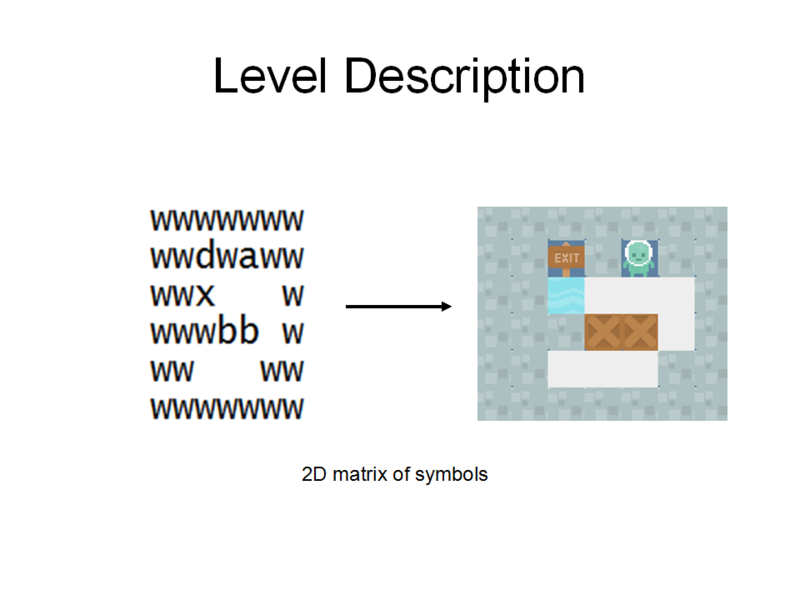 The Level Description File describes the level layout (Sprite arrangement). Let’s take an example. This game is called WaterGame. It’s super simple game where you have to move the avatar towards the exit. The problem is the path is always blocked by water. If avatar touches water, it will die. In order to pass the water, the avatar should push boxes over it (Box destroys the water, you can think it floats). That’s the Game Description File for that game. It is divided into 4 sections (SpriteSet, TerminationSet, InteractionSet, and LevelMapping). 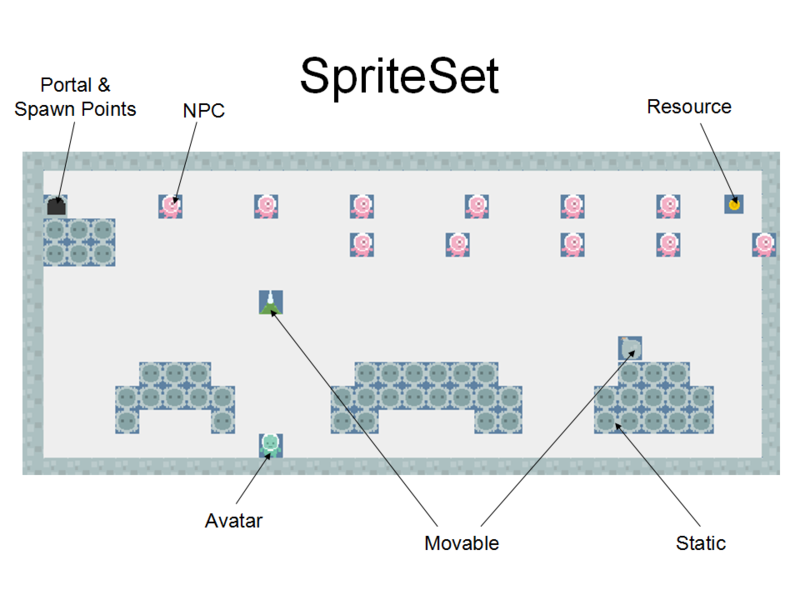 SpriteSet: explains all the game sprites (their type, their rendered image). For example “avatar” is defined as of type “MovingAvatar” which means it can move in all 4 directions and it has an image called “avatar” (All images must be in sprites folder). TerminationSet: explains how should the game ends? For example “SpriteCounter stype=avatar limit=0 win=False” means if the number of “avatar” sprites are equal to zero, you lose the game. 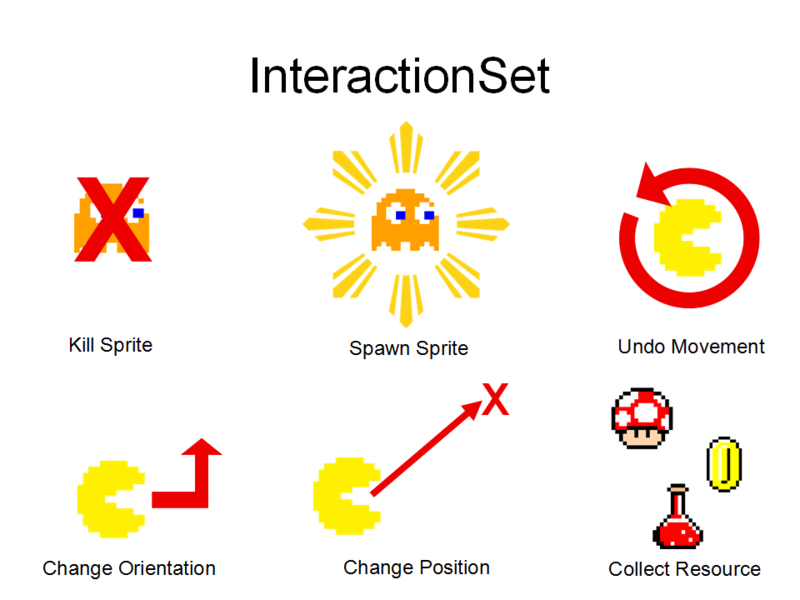 InteractionSet: explains the result of collision between sprites. For example the first collision says if “avatar” collides with “wall”, the “avatar” should “stepBack” which means undo its last movement. LevelMapping: just helps the VGDL engine to parse the Level Description File. The VGDL engine just replace each character with the corresponding sprites. 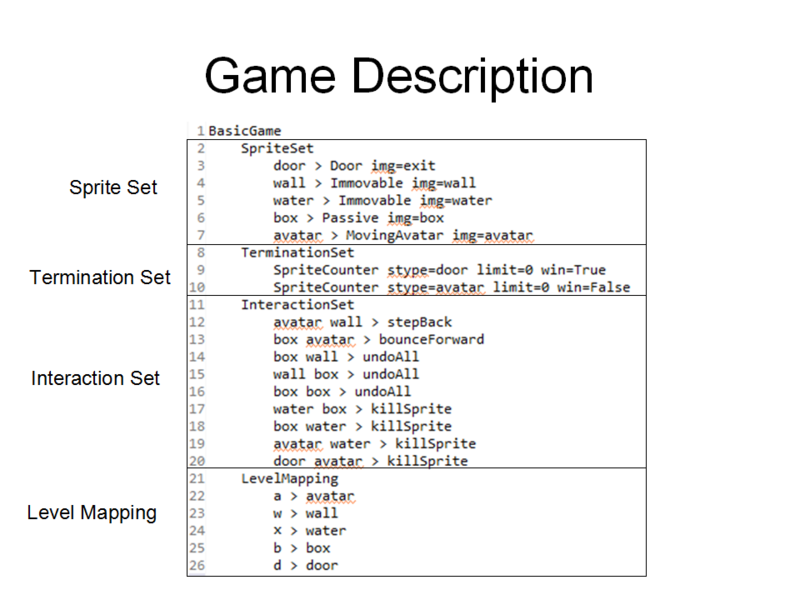 The Level Description File is a 2D matrix of characters described in the LevelMapping section. The VGDL engine just replace each character with the correct sprites and voila the level appears. Movable: It is an object that is affected with physics like missiles. Static: It is not affected with any physics even its applied on it like walls. SpriteCounter: It terminates the game when the number of certain sprite is larger than or equal to certain value. 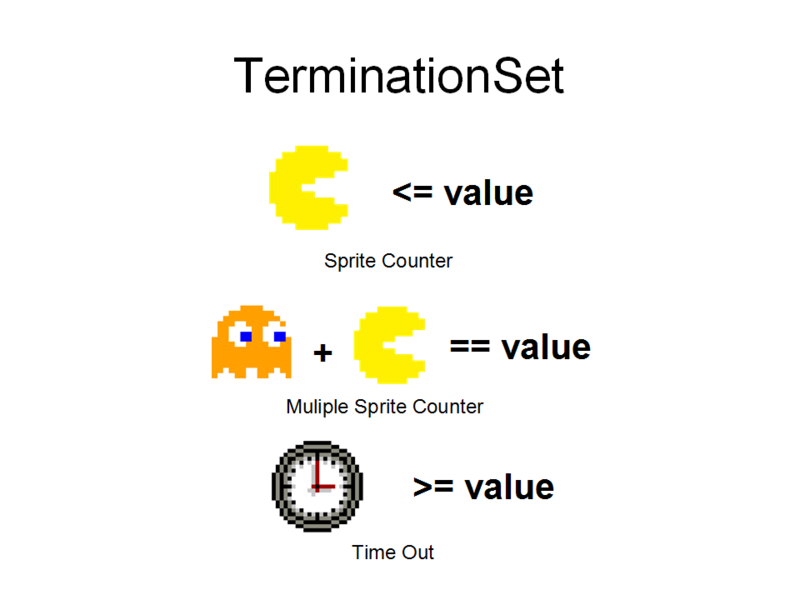 MultiSpriteCounter: It terminates the game when the summation of two different sprites equal to certain value. TimeOut: It terminates the game when the game time is larger than or equal to certain value. 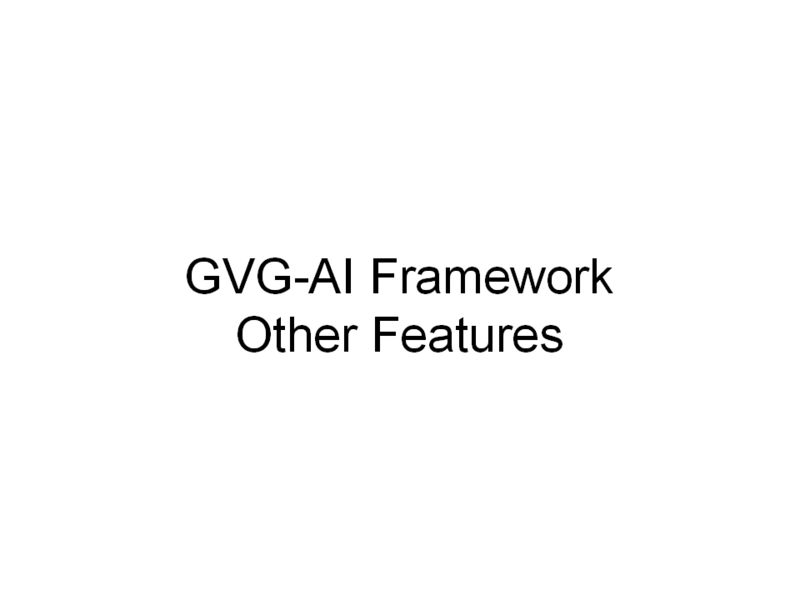 The following slides will focus on the GVG-AI framework and what does it offer? For more details check GVG-AI website documentation (link). 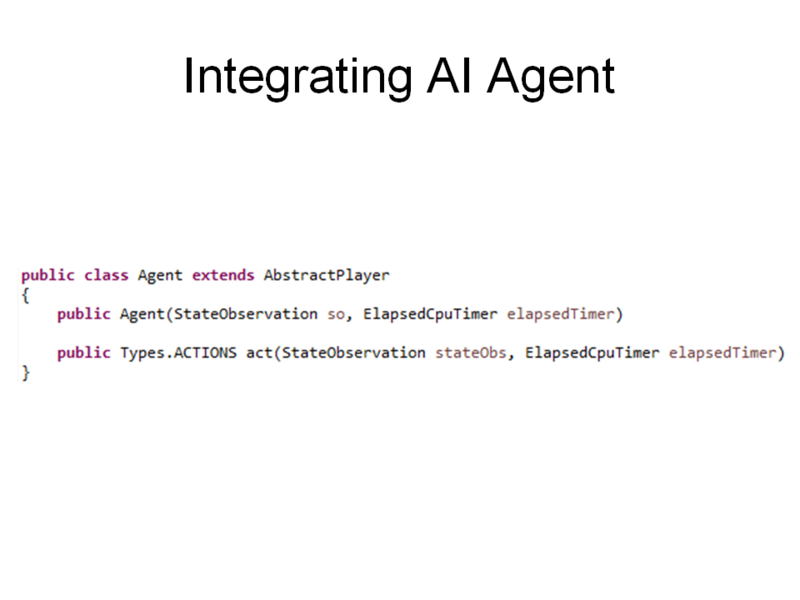 You can integrate an AI Agent that plays VGDL games just by extending AbstractPlayer class and providing a constructor and an act function which returns the avatar action every single game step. 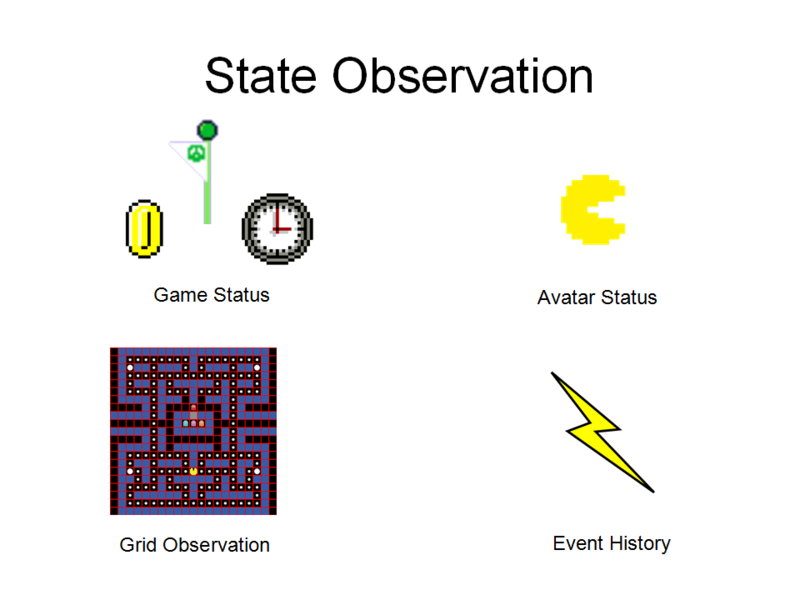 The framework also supports a StateObservation class that wraps the current game status (winning, score, and time), avatar status (speed, position, and orientation), grid observation for all the game (also it supports arrays for different sprite types), and Event History for all collisions happened due to the avatar or a sprites spawned by it. 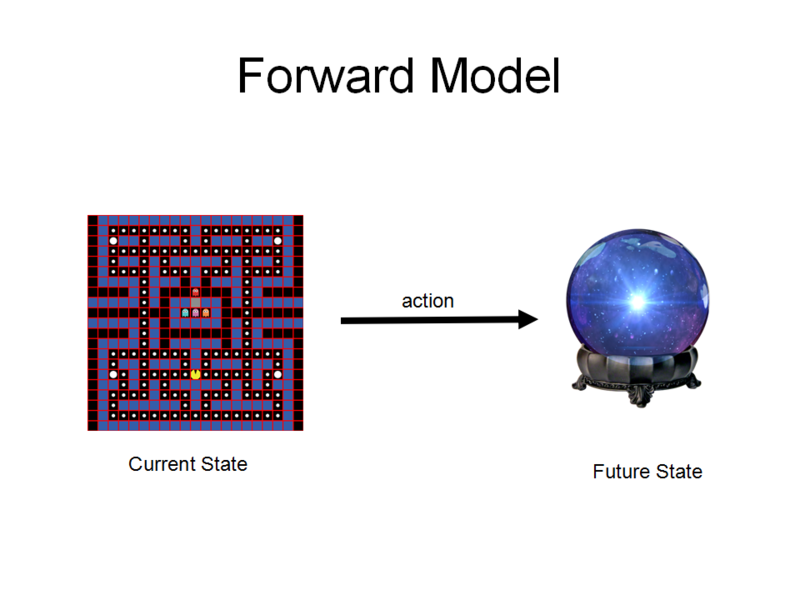 The StateObservation class provides forward model that can predict the future but not exactly as most games are some how stochastic. Last thing the framework comes with couple of sample agents to help you understand how to write your AI agent. 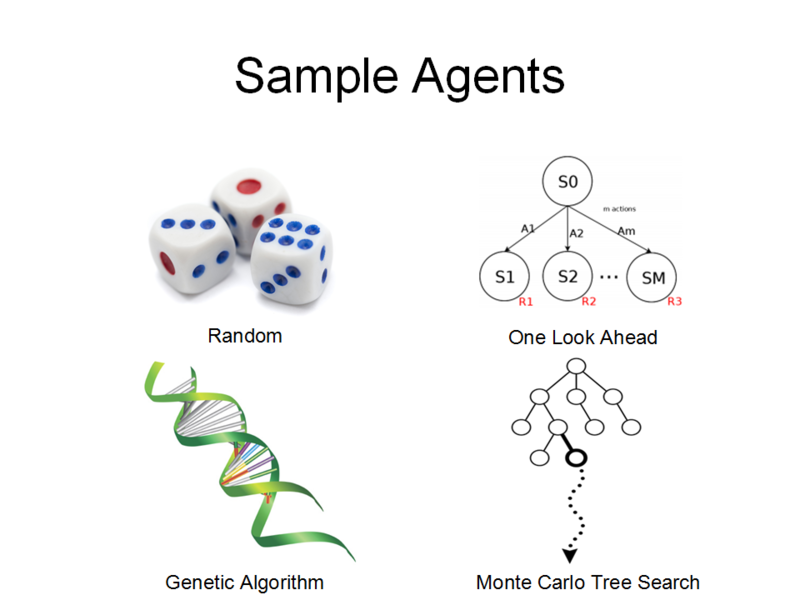 For example: Random Agent, One Look Ahead, Genetic Algorithm, and Monte Carlo Tree Search. That’s the whole presentation. I hope it encourages you to use VGDL to prototype your games or even participate in the next GVG-AI competition (link). The Game Innovation Lab is trying to improve all the drawbacks of the VGDL language and even start a PCG competition track (link). 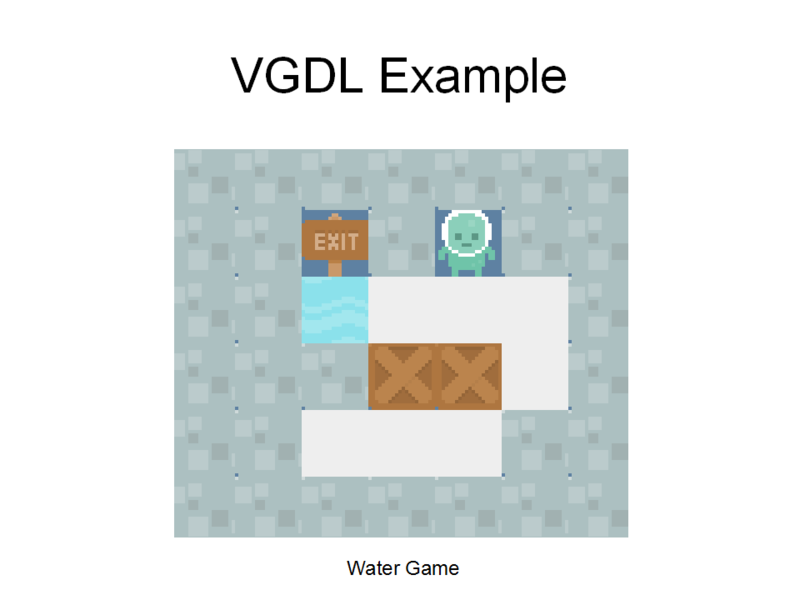 This entry was posted in Presentation, VGDL. Bookmark the permalink. VGDL looks promising. Maybe if there is a tool that converts already made games to VGDL, that would make it more popular.